Sam Cornett :: Mr. Nashville Talks with Larry Ferguson: Hank Williams Jr. sang a song called Standing In The Shaddows. Hank Williams Jr. sang a song called Standing In The Shaddows. I was listening to this song the other day, and it made me think of my good friend, Ralph Stanley II. Being the son of legendary Dr. Ralph Stanley could not be easy. Expectations exceed all possibillities, but Ralph 2 isn’t trying to fill any shoes, he is simply carrying on a name and a sound of mountain music you won’t find anywhere else. At the early age of two, Ralph 2 went out on the road, at four he began to play the guitar, and at fiftean took over as lead singer for the Clinch Mountain Boys. Many greats such as Larry Sparks, Ricky Skaggs, and Kieth Whitley were all lead singers for the Clinch Mountain Boys. Ralph 2 has been compared to the late great Carter Stanley, by fans everywhere, I assure you, Ralph Stanley II is in a class by himself! I encourage every fan of music to visit www.ralph2.com and check out his newest album, it delivers! Ralph 2 has been married to Kristi Stanley for 17 years and they have two beautiful children together, and reside in Coeburn, Va. I was talking to Kristi very late the other night, she told me the one thing that makes her husband so great is that he is nice to everyone. It doesn’t matter if your homeless or the president, he treats everyone the same! That was moving, and says a lot about Ralph 2! I met Ralph 2 in 2003, nearly 15 years ago we have been close friends ever since, I am proud to say I’m a family friend. 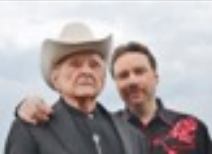 It is an honor for myself as a writer to co write with Ralph Stanley II, currently him and I are working on an amazing tribute song about Dr. Ralph Stanley, I consider myself very lucky and blessed to be a part of this project. One day you're hot, one day you're not!